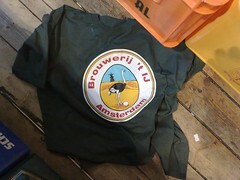 3 Months to go & I’m working at Brewery ‘t IJ for 14 years. Tapping & serving beer. Shouting the bar is closed. Get rid of the garbage. Have a talk with my colleagues. Leaving messages in our journal for the ones that are not there that day. Doing some other things too. I used to work in a public library. On saturdays. That was also for a period of 14 years I was doing that. 2 Times 14 years makes you an old man.